Dave Denison’s article about the long poetic career of Brendan Galvin ’60 (“‘Getting the Word Right’,” Fall 2015) does a wonderful job of describing both the man and his work: “. . . You know from his poetry, and upon stepping into his house, that the center of his being is in paying close daily attention to live creatures.” Having known Galvin for years and reviewed some of his books, I can attest to the accuracy of Denison’s observations. Galvin’s poetry reminds us always to be on the lookout for intriguing occurrences and objects that too often fall beneath our attention. There is a quiet sense of awe at the heart of his poems, a world replete with epiphanies of the commonplace and the promise of renewal, various kinds of gifts. Denison rightly observes that clarity, accessibility (not simplicity), narrative, rich vocabulary, and sharp imagery account for the appeal of Galvin’s poetry. The author is Distinguished Professor Emeritus at East Carolina University. Dave Denison’s profile was a delightful introduction to a writer I had somehow missed and would like to know better. And kudos, too, for the tasty and scholarly Prologue on the importance of poetry. I always look forward to the inside cover. The Fall 2015 issue had many wonderful articles and was particularly strong in its treatment of white men. I really resonated with New York Times columnist David Brooks’s urging, in his First Year Academic Convocation address, for the development of both “resume virtues, which get you a job” and “the much deeper eulogy virtues, the things they say about you long after you’re dead” (“On Virtue”). How fitting, then, that the teaching style of John L. Mahoney ’50, MA’52, H’03 (celebrated in “Eminences”), was organized around presence, heart, knowledge, voice, and withdrawal, rather than the typical resume virtues, and that poet Brendan Galvin’s writing is steeped in his philosophy of living in the present. In the coverage of the discussion of race in America with Ta-Nehisi Coates (“Standing Room Only”), however, the content of his talk was notably absent, and the brief mention of Eradicate Boston College Racism’s call to action was also deficient. How ironic that recounting “the University’s inadequate response to black student concerns” was itself inadequate. What are the concerns? What action has been taken? How does this intersect with activism around race and racism on other campuses? I was so excited to read that Ta-Nehisi Coates came to Boston College. His book Between the World and Me is a beautifully crafted and yet raw, painful account of what it means to grow up as a black man in this country. As a white woman, I can never understand the experiences he describes. But that doesn’t mean I can’t learn from them. During my tenure as a public school teacher in the Bronx, my male students were often the targets of New York City’s controversial “stop and frisk” policy. After listening to their frustrations, I offered what I’m sure was predictable advice: Cooperate with the police, avoid any trouble. Reading Coates’s book gave me a deeper understanding of the true violation of such procedures, and the invasion of privacy and, as Coates says, the body that they represent. I wish I could go back in time and invite further discourse about those encounters. Only by initiating tough conversations about the prejudice and racial inequality that still exists in America can we hope to make meaningful change. Coates’s work should be required reading for the entire Boston College community, so that we may increase our understanding and empathy for one another, regardless of the color of one’s skin. Re “Eminences,” by Ben Birnbaum (Fall 2015): Pace T.S. Eliot, but, on recent evidence, September, which began with the deaths of John Mahoney and Jim McIntyre ’57, M.Ed.’61, D.Ed.’67, H’11, within days of each other, may now qualify as the cruelest month. And yet, the occasion for solemn remembrance is also an occasion for joyful remembrance. I first interacted with Jim McIntyre in my sophomore year, 1966–67, and it is very possible that I was one of those “restive students” he was spied conversing with. Birnbaum is dead right when he observes that “his courtesy to students was repaid by trust.” I have no doubt things could have been a good deal worse in those days had it not been for Jim McIntyre’s hard work, good judgment, and, yes, courage. Jim loved T. S. Eliot, and often at the end of a long day he would settle into a comfortable chair and quote from “The Love Song of J. Alfred Prufrock,” mimicking the poet’s distinctive nasal intonation: “I grow old . . . I grow old . . . I shall wear the bottoms of my trousers rolled.” Jim was only in his thirties then, and he was being wry. Eventually, of course, he did grow old, but his love for alma mater never did. He continued working for her success until literally his dying day. “Eminence” is indeed the word for my colleague John Mahoney, and it is one reason why I won’t take his name off the door of the office we shared as faculty emeriti (English). John was pleased with his long publications record and with his decades of important service to the department and the University, but he was proudest of his impact on students. He would often read me portions of letters students wrote him, years after they took his class. A month after his death, a former graduate student, visiting with his family, came seeking John in Stokes Hall, knocking on the door that bore his name, and mine. He told me about his life—he didn’t find a job in teaching, so turned to his second love, the environment, and among other exciting things worked for a time in the dangerous cleanup phase at Chernobyl. But mostly he wanted to relive the memory of John, and I was grateful. Those conversations are the other reason I won’t take his name off the door. The way John Mahoney taught, with seemingly contradictory excitement and calmness, created my teaching style. I still channel his energy and remember his complete focus. When I was dean at Katharine Gibbs School in Boston, John was the source of our best English teachers. When Gibbs became degree-granting, John joined the first board of trustees and served with distinction. John was generous with his limited time, and when he had to move on he signaled the end of a conversation with style. Everyone knew that when he put a hand on each knee, the conversation was over, for a while. John, the conversation is one-sided now but not over. 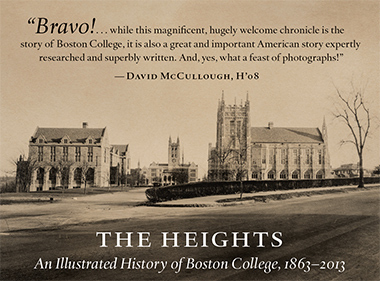 I arrived at Boston College in 1976 as a junior transfer and English major, with a particular interest in all things British. I had the very good fortune of enrolling in one of Professor Mahoney’s much-in-demand courses that fall. It is not an exaggeration to say that the experience of sitting in his classrooms over the next two years was, for me, life-changing. I corresponded with Professor Mahoney on and off after my graduation, and I still have several of his thoughtful letters, always bursting with ideas, philosophies, updates on his many projects, and encouragement—always encouragement—for whatever I was doing. Somehow, he was even able to elevate my summer waitressing job at the Howard Johnson’s in Provincetown to something noble and replete with opportunity and potential. Re “Goal-l-l-l-l” (Fall 2015): Agreed that shooting first gives an advantage. But I don’t like games to be decided on penalties. My solution is to take off one player from each team for the first overtime and play 10 on 10; if the game remains tied, take off another player and play nine on nine. The writer was goalkeeper for the men’s soccer team, which advanced to the Elite Eight of the NCAA tournament this past season. Update: At the first stage of the international Olympic trials in January, Erika Reineke ’16 (“Guster,” Fall 2015) placed 17th out of 81 in her laser radial event. U.S. Olympic contenders Annie Haeger ’12 and Briana Provancha ’11 (see below, on the cover of the November/December 2015 Sailing World) will compete in the two-person 470 trials in late February. Haeger was named Rolex Yachtswoman of the Year, U.S. sailing’s highest honor.